Self-ligating braces are the modern choice in orthodontics. They have provided a breakthrough in orthodontic treatment and comfort. 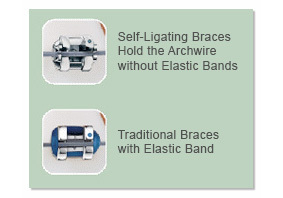 Ordinary braces use "elastic bands" (technical name "ligatures") to secure an archwire into a slot in each bracket. This is called ligation. The bands can become stained or stretched - requiring your orthodontist to change them. They can also retain food particles, making it more difficult for you to keep your braces clean. Self-ligating braces are different. They don't use ligatures to hold the archwire - they are self-ligating. Instead of elastic bands, they use small metal clips to hold the archwire into the bracket. So you can forget about the problems associated with elastic bands. We all would like more time for ourselves. With ordinary braces, part of the time spent in the orthodontist's chair is taken up with the placement and removal of the ligatures. With self-ligating braces, there is no need for ligatures so you can be in and out of the chair faster, and may even be able to return less often. We use the Damon and Smartclip self-ligating systems and these are both available in metal and clear (ceramic) options.